The theme of baptism continues in this Sunday’s Gospel, re-affirming that Pascha is a feast of resurrection and of baptism, being born into eternal life. 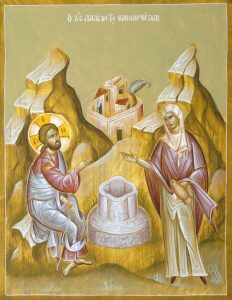 The center of Jesus’ conversation with this unnamed woman (the Church later gave her the name Photine, the “enlightened woman”) is about water. They met at Jacob’s well, a place of great tradition, a sign and a promise of God’s love and mercy for his people. Jacob’s well provided the riches of water to a desert place, the sign that God would always provide for and bless his people. However, the encounter with the woman reveals something more: Jesus is the Messiah to come, he is greater than the Patriarch Jacob. The water of Jacob’s well is only for this world, Jesus would give “the water that would become a spring of water welling up to eternal life” (John 4:14). This clearly refers to our baptisms, as it comes immediately after the comparison of Jesus with John the Baptist, and the baptisms done by Jesus’ disciples. We renew our baptism every time we receive Communion, and they are for life, for eternal life, from God, the giver of life. A couple of observations: as for Nathaniel, Jesus signs his ministry with intimate knowledge of the people he meets. He sees Nathaniel under the fig tree, and he tells the woman about her five husbands. In both cases, they become his disciple because of his knowledge of him. This is a theme of John’s Gospel, the shepherd knows his sheep and his sheep know him. Second, it should be to our wonder that Jesus always comes to the most underprivileged. To whom does he reveal the mystery of eternal life in baptism: to the paralytic who had no friends, to the woman who had led a shameful life, and came to the well at noon who no one else would be there, and to the blind man suspected of sin because of his blindness. And the disciples marvel that Jesus speaks to a woman! Not just any woman, but a heretical, decadent Samaritan woman! Are we humble enough to accept Jesus as our Messiah?